After Fitzhugh’s death, her literary executor, Lois Morehead, began mining her papers for further publishable material. The first to appear was I Am Five, a picture book which Fitzhugh had written and illustrated. Published by Delacorte in 1978, this book received a positive review from School Library Journal. According to this review, there were four books in manuscript covering ages three to six: however, only three were published, and only this first one with Fitzhugh’s illustrations. 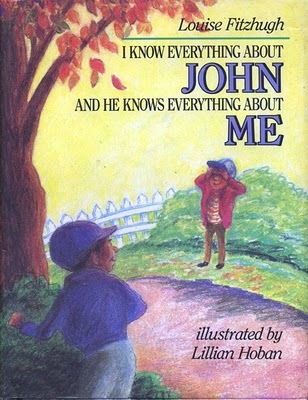 When I am Three came out in 1982, the review in School Library Journal praised the illustrations (by Susanna Natti) but criticized the text: it is hard to know if the text and images would have worked together more seamlessly if they were both Fitzhugh’s work. I am Four also appeared in 1982, with illustrations by Susan Bonners. Sport (dealt with in detail here) was published from a manuscript in 1979. There is no doubt that Morehead made all her decisions regarding posthumous publication, movie and play versions, other authors continuing the series, and which publishing house to deal with, out of her deep love of the material and her sense of obligation to her friend Fitzhugh. This is clear from Virginia L. Wolf’s description of her dealings with Morehead while researching and writing her bio-critical book on Fitzhugh. Morehead’s obituary makes mention of her work on behalf of Fitzhugh’s estate, indicating this work was important to her. This only makes some of her choices all the more baffling. She withdrew at least one manuscript, called “The Owl and the Lark,” from the publisher, feeling that it did not meet Fitzhugh’s usual standards. Charlotte Zolotow disagreed with this decision, thinking it worth publishing. (Wolf, 26, 137) Therefore we cannot say that Morehead uncritically released all Fitzhugh’s manuscripts. But Sport and the picture books not illustrated by Fitzhugh seem like a mistake. They were not in finished enough form to convey the authorial intent to the reader. And the decision to allow other authors to utilize the characters of Harriet the Spy is out of line with what we know about Fitzhugh and how closely she guarded her writing. Following the publication of Harriet, she had a hard time accepting any editorial guidance at all: it is unlikely she would ever have seen clear to allow another author to take control of her creations. The decisions surrounding non-book adaptations, on the other hand, seem the easiest to understand. Adapting a book to performance necessarily involves cutting and rearranging material, but because performance brings other kinds of visual and interpretive information to the mix it can enrich the material as well. New media can bring new readers to the work, and it is almost impossible to say in advance whether a film or play adaptation will be successful. In these cases Morehead likely simply hoped for the best, and hoped for increased exposure for the works of Louise Fitzhugh. Several still-unpublished manuscripts are among the papers of Louise Fitzhugh. It is not clear where these papers reside now that Morehead has died, but Wolf read through many of them. She found a play and a novel for adults, as well as two unfinished children’s novels, and two picture books (“The Owl and the Lark” and “I Am Six”). The manuscript for a young adult novel on a lesbian theme, called “Amelia,” disappeared long before she died. (Cook) At this point, however, it seems that the best we can hope for is that the manuscripts remain in manuscript. Dorsey, Margaret A. Review of I Am Five. School Library Journal January 1979: 41. Maloney, Brenda Durrin. Review of I Am Three. School Library Journal September 1982: 108.
Review of I Know Everything About John and He Knows Everything About Me. Publisher’s Weekly November 8, 1993: 74-5. “A Picture Book Mix-Up.” Publisher’s Weekly November 22, 1993: 30. Wolf, Virginia L. Louise Fitzhugh. (New York: Twayne, 1991).